At the New York Historical Society you can now see, on permanent display, what is surely the biggest Picasso in NYC! 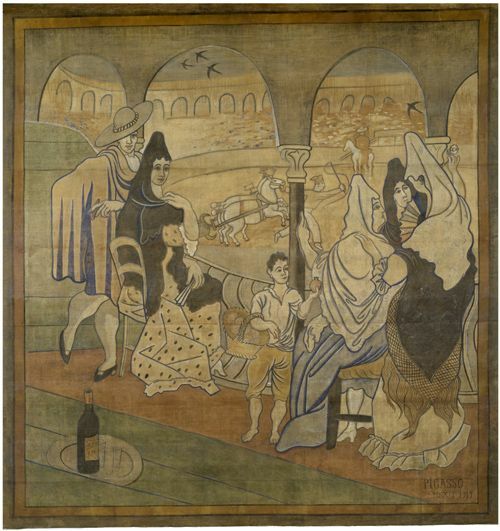 The canvas was once the front cloth for Le Tricorne, from 1919, designed by Picasso, and shows a traditional corrida scene. In 1928 Diaghilev cut the middle section cut out of the cloth and sold it to raise funds. It was bought by a private collector. In 1957 it was acquired by Phyllis Lambert, architectural historian and daughter of Canadian business magnate Samuel Bronfman, CEO of Seagram Liquor Empire. The cloth was displayed in the Four Seasons Restaurant in Seagram Building from 1959 – 2014. Here is a great video showing the installation of the cloth. Also on display at the New York Historical Society are 11 facsimile costume designs and a video of the 1994 Paris Opera version of Le Tricorne. The costumes and sets for Le Tricorne were made in London in 1919. 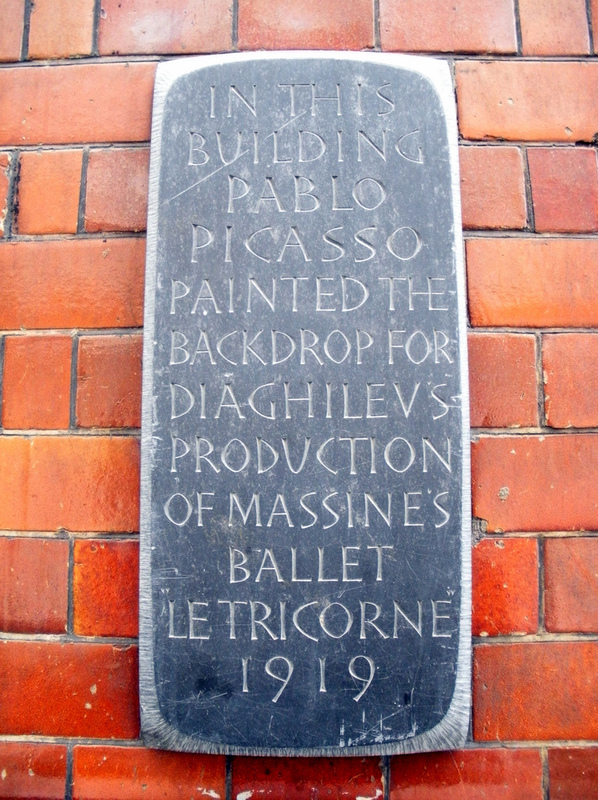 A studio in Floral St was hired by Ballets Russes set painters Vladimir and Elizabeth Violet Polunin. It was here that the sets for Le Tricorne were painted. Diaghilev, Polunin and Picasso in the studio in Floral St. The commemorative plaque on the studio building in Floral St.
Next time you are in NYC go and see this beautiful piece of Ballets Russes History.